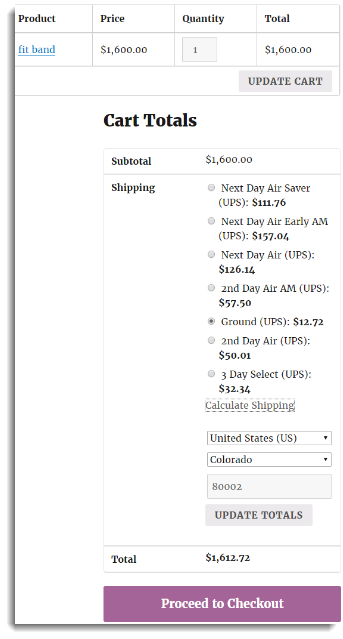 In this article, we will show you how WooCommerce UPS Shipping plugin with Print Label works. It covers the functionalities like UPS real-time shipping rates, shipping labels, live UPS tracking, and much more. It is expected that the reader knows how to install the plugin. For more information on “How to install and set up the plugin,” kindly browse through our Setting Up WooCommerce UPS Shipping Plugin. Assuming that the plugin has been installed, let us understand it point by point. Place an order with valid recipient address –> the plugin requests the UPS for appropriate rates –> the UPS responds with various services and rates applicable for this order –> customer can see these services & rates on the cart page. This whole process is referred to as – Fetching of real-time rates. 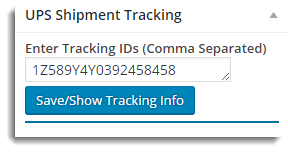 In the snapshot below, we can see that, based on the address, the UPS has returned the shipping rates and services. Once the order is made, we can go to that particular order and select a button at the top right-hand corner called “Confirm Shipment”. Now, we see every other detail is taken care of by the plugin. We only have to generate packages and confirm shipment. We have printed the sample label for you by clicking on the “Print Label” button. Tracking information is displayed in the Live environment only. 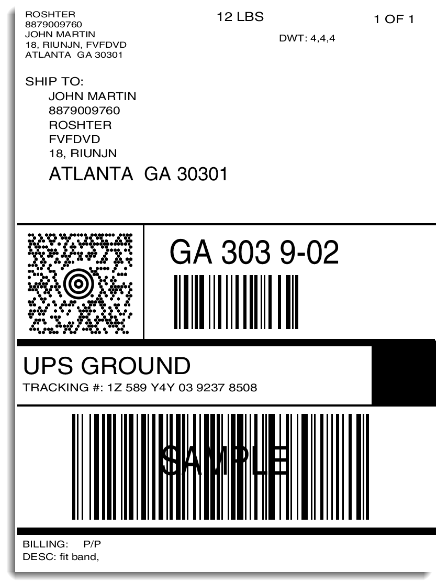 In the test environment, UPS shipment tracking will not display any tracking details as it would require a live tracking ID for a genuine order. Once the order page opens, we see a drop-down menu called ‘Order Status”. To complete the order, the shop owner has to mark it as “Completed order” in “Order Actions” tab towards the top right-hand corner. This will change the “Order Status” to “Completed”. As soon as you mark the order as completed, the plugin will send the tracking details attached to the order completion email. Now, we have covered a high-level end-to-end working of the product! Also, check out our UPS Shipping plugin review at Cloudways. Hi there, we have a client that we set this plugin up for. After they select an order, and scroll down to the bottom of the page and click “confirm shipment” it’s taking us from the back end to a “404 error” page on the website. Is there something that I’m missing or what might we be doing wrong? Thanks for your input on this. This seems to be an issue with your website server. Could you please do one small test? Kindly deactivate our plugin and check whether the issue still persists or not? In case the issue still remains, please do contact your hosting provider and check with them. We will immediately check this.